The man in the title of this story would shrug off such a grandiose description. Costis Cavoulacos, our Athens city guide, would resist any such claims to fame with a humble shake of the hand and head. “No, no. That’s not me, my father perhaps. My company, yes. But not me.” But despite this being a city of ancient landmarks, Costis is a modest man. We met Costis, an architect who lives in Athens’ suburbs, in the lobby of our hotel, Athens’ grand dame, the Grande Bretagne for a three-hour city tour. 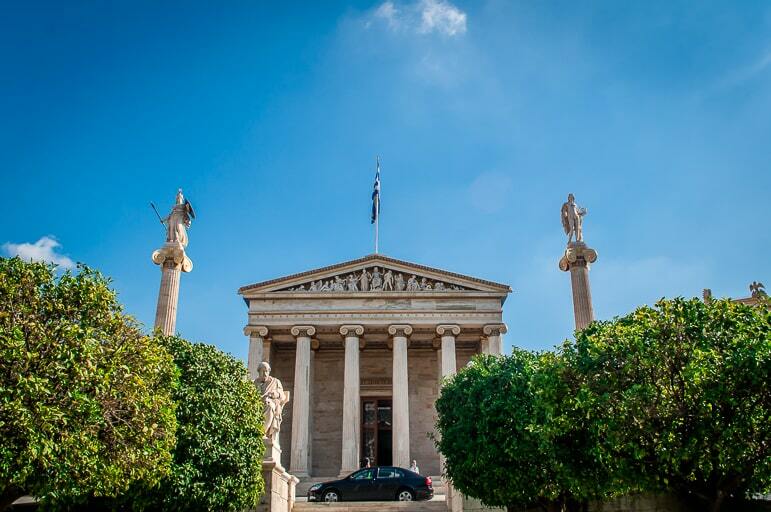 A tour of the Greek capital is an opportunity to walk in the footsteps of history. The ability to see, touch and sense an ancient past that has attracted visitors for generations. However, as with all well-known destinations there is another side. Away from internationally recognised landmarks, like the Acropolis, there is the beating heart of a place that local people simply call home. We wanted to get a feel for this side of Athens and to see some of the genuine districts where people live, work and play. Looking for a different type of tour we plugged into a great local initiative known as This is My Athens. 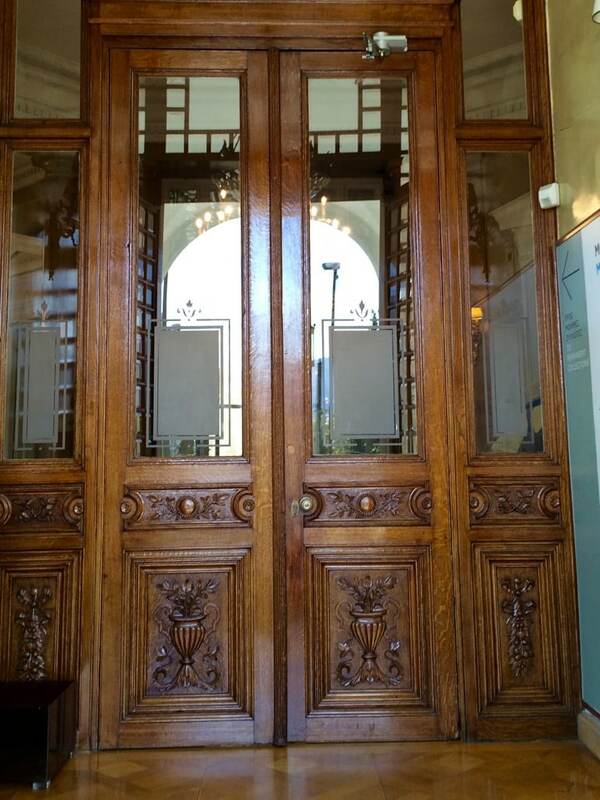 A free service, it is run in conjunction with the city’s tourist office, but by local people. These people were born in Athens, or have long lived in and long loved this fabled city. The beauty of it is that’s where the fables end. The tours are a slice of real Athens – you explore the city as a local, taking in and falling in love with the things Athenians adore. 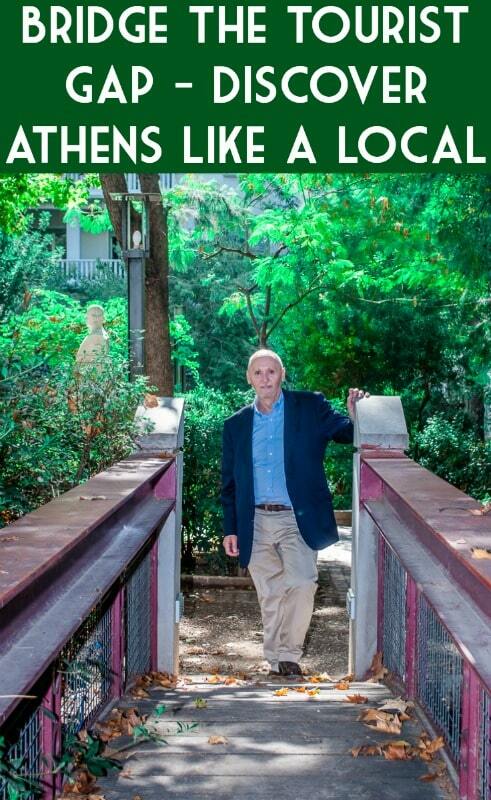 This is My Athens guides allow visitors to see beyond the tourist trail and get a feel of the real city. Finding a This is My Athens guide is simple – visit the website, select what you’re interested in seeing, leave a few details about yourself and they will pair you with a suitable local guide. 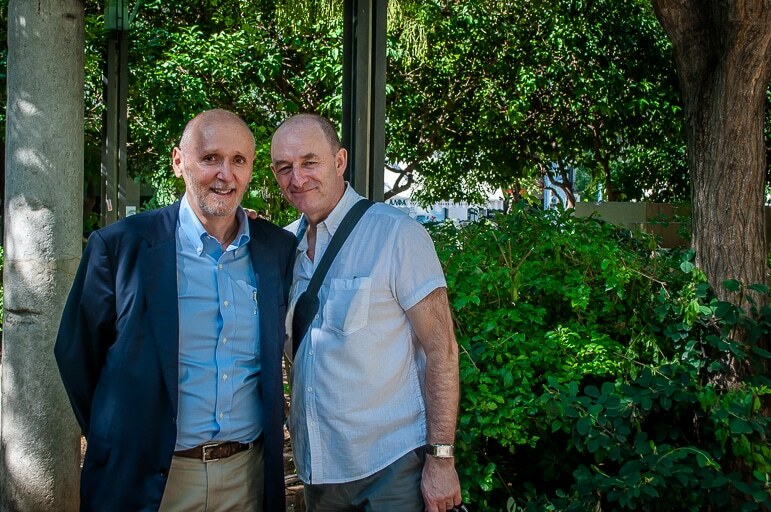 As luxury travel writers, exploring the city in the way you, dear reader, would expect, we were paired with Costis, due to his wealth of knowledge of the city’s upmarket area, Kolonaki. 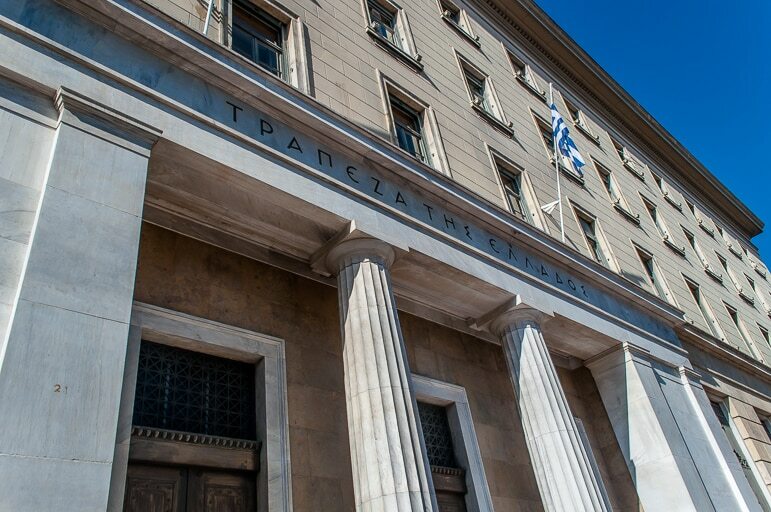 The tour started in a traditional manner with Costis pointing out landmarks like the Greek Central Bank, and Coin Museum, formerly the home of Heinrich Schliemann the archaeologist who discovered the site of the ancient city of Troy. 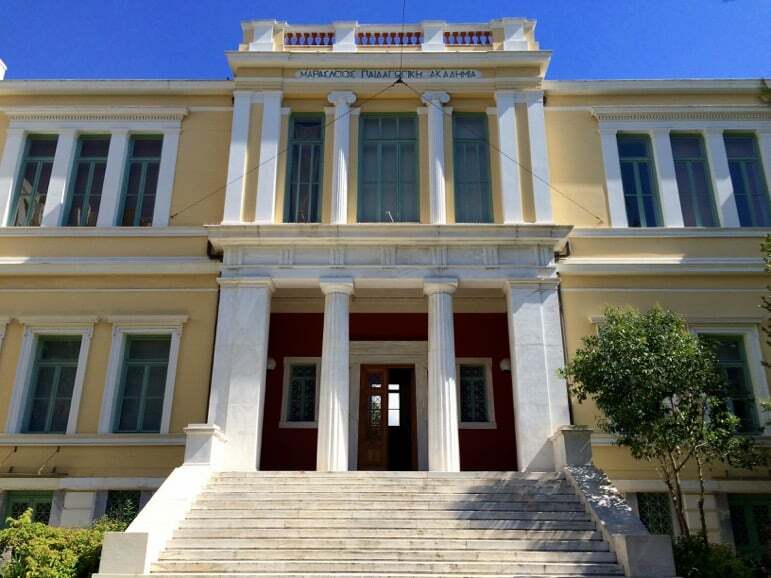 Then the Academy of Arts, to name just a few beautiful buildings with marble facades and solid marble steps leading to heavily decorated doors (though even Costis had to confess the Greek Central Bank building was less than spectacular). 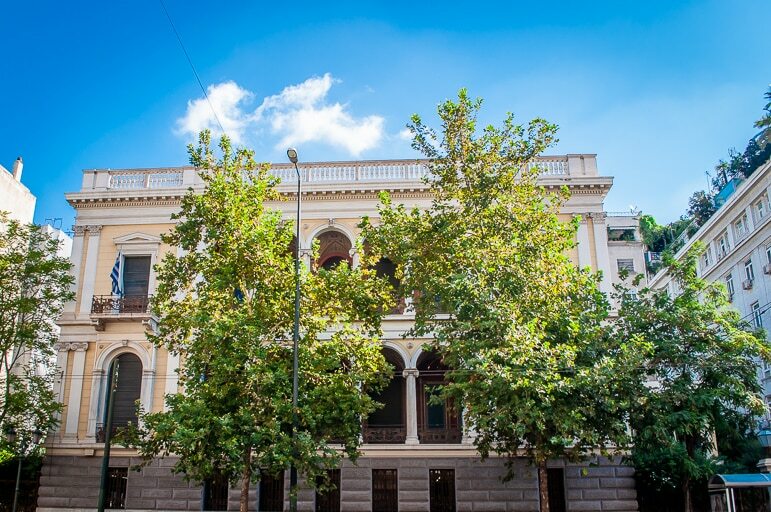 Guiding us around Kolonaki, Athens’ classy quarter, Costis’ own life story unfolded among its leafy streets. He showed us where his family lived, the maternity hospital where his father was born in 1929, and where his father went to school. An engineer, Costis’ father worked on many of the city’s notable buildings including the renowned Athens concert hall, the Megaron. Costis also has a number of landmark buildings around the city to his architectural credits. Though a humble man who would shake off our claims to his building fame; the size, number and scale of his efforts mean that Costis (and his father) really did leave their mark on Athens. But that’s not the only way in which the Cavoulacos family is engrained in the city’s past. Costis’ grandfather owned a grocery shop that supplied food and other provisions to the Greek royal family. The shop closed during Nazi occupation of Greece in the Second World War and after the royal family had left the country, when food and other produce became scarce. Costis showed us the site of his grandfather’s shop, now a bank on the edge of Kolonaki’s famous square which still has one of its original ancient Greek columns. Wandering further through the area, Costis gave us a flavour of Kolonaki, a relatively small area, of five blocks by ten, but packed with boutique and jewellery shops, galleries and museums like the Cycladic Art Museum, outstanding architecture, divine bistros and cafés. There streets lined with orange and acacia trees shaded us from the brilliant Athens sunshine. 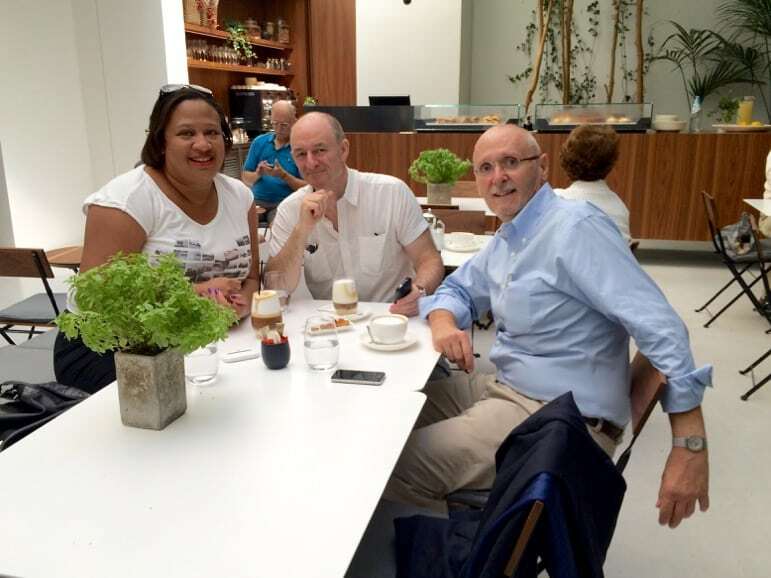 Half way through the tour we took a relaxing stop for coffee at the Cycladic Art Museum. It is a wonderful museum combining permanent and temporary exhibitions in two separate but connected buildings. 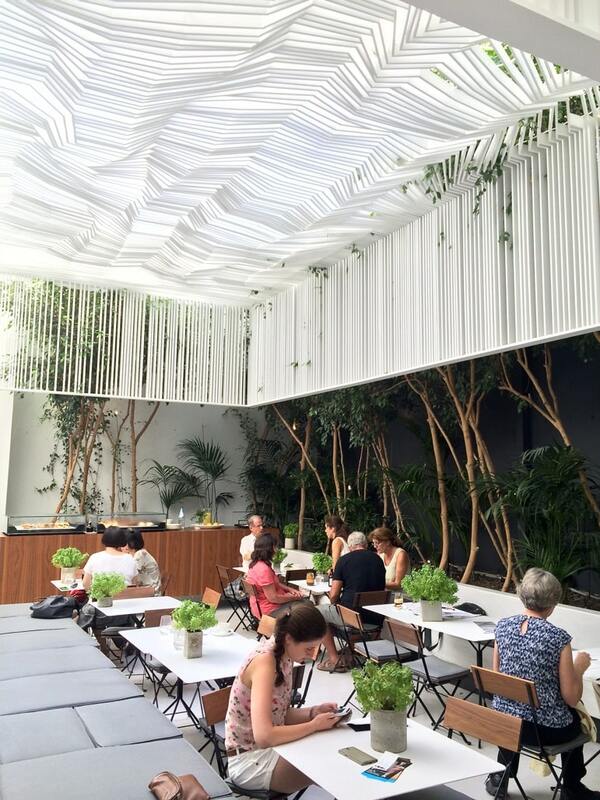 While it is an interesting place to visit in its own right, the cafe there is of a very modern even futuristic design. The juxtaposition of new and old under one roof seemed to symbolise the complex but fascinating city of Athens. But Costis had yet more to show us of the different faces of Athens. Eschewing the ancient relics for Kolonaki’s streets he revealed its various architectural styles, showcasing a living history of building design from neo-classical to Art Deco and Bauhaus. One of the advantages of having a This is My Athens tour guide is that it is a very personal tour and tailored to individual needs. We didn’t have a large group with all the issues that brings with it, indeed the maximum number on any tour is six. We were able to go at a speed that suited us, stop when we wanted to, ask questions and discuss the tour in a very comfortable and informal manner. But there was more than this. Costis, didn’t just give us a tour he opened the door to another side of Athens, bringing the area to life in a way that only a local can. His personal insights, his love of architecture, and tales of his family history transformed Kolonaki from an up-market neighbourhood into a personal story of a living breathing community, full of rich characters and an eventful history. You can book a free city tour with your particular interests in mind on the This is MY Athens website. I strolled the streets of Athens as part of a project sponsored by Athens Convention & Visitors Bureau organised by Toposophy. Find out more about the themes being covered in the project from luxury to food connoisseurs, solo travel, culture and nightlife on the Who Do You Think You Are site. All views and tired limbs are entirely my own. I know Costis and his family, so it was great to read this article and find out more about what he is keeping busy with. I am now in Boston, but it makes me feel more at home to know that a warm and friendly person like my friend is showing people around the city! He does know a great deal and he has his mother’s sweet charm and personality. I hope that many more visitors have the opportunity to see this side of Athens. It is certainly unique!